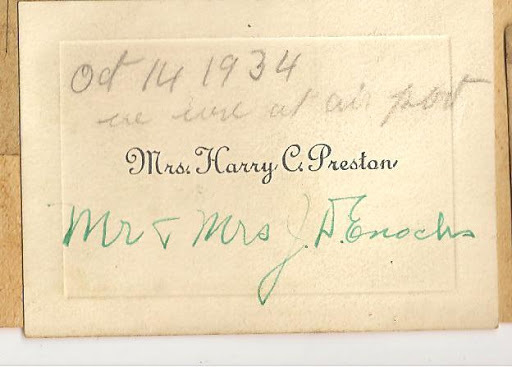 My 2nd great grandparents were married. Mary Jane Daugherty (John L.,John, John) and Daniel Parham Gregory (John Keatts, William, John, Thomas III, Thomas II, Thomas, Richard). They had six children and were laid to rest at the Daniel Gregory Cemetery in Clear Fork, Tazewell County, VA. Mary Jane was the granddaughter of Tazewell County pioneer, David Ward. 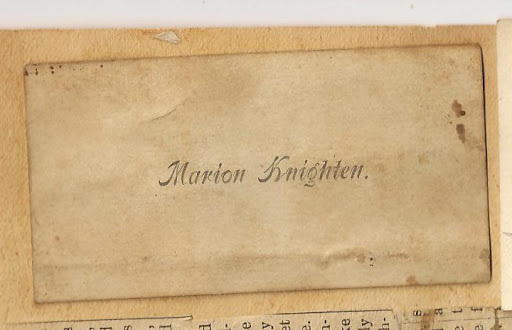 Her brief obit is preserved in an old scrapbook belonging to her namesake granddaughter, Mary Jane Davidson. Note the 1850 Census for Tazewell Co., VA, Western District, p. 179, 24 Sept.
Mary is Mary Clay Gregory, the younger sister of Daniel Parham Gregory. I would say this is how Daniel and Mary Jane Daugherty met. 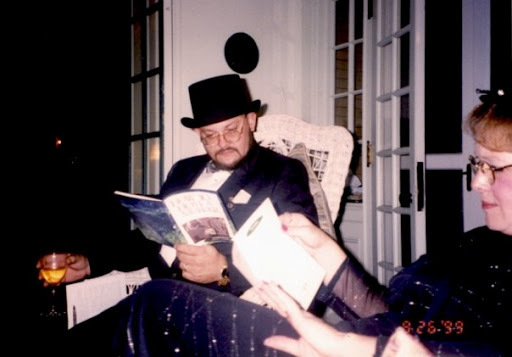 (speculation Browne Hollowell) And I would bet that living in Chas. H. Greever’s house as probably a servant or helper to Eliza Greever, that Mary Jane named her next daughter after a woman who had been kind and a friend to her. Were they related? I don’t know. 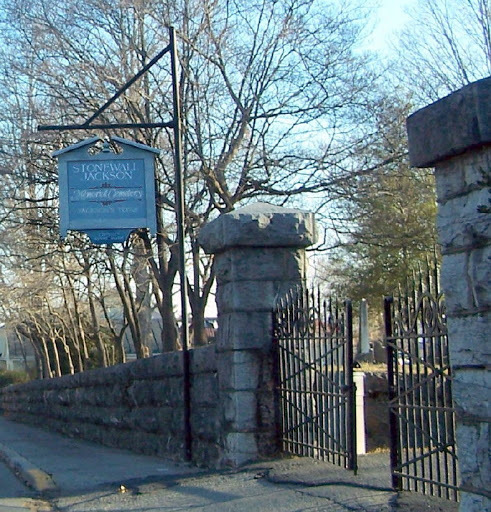 Charles and Eliza are buried at the Greever Cemetery at Five Oaks in east Tazewell. 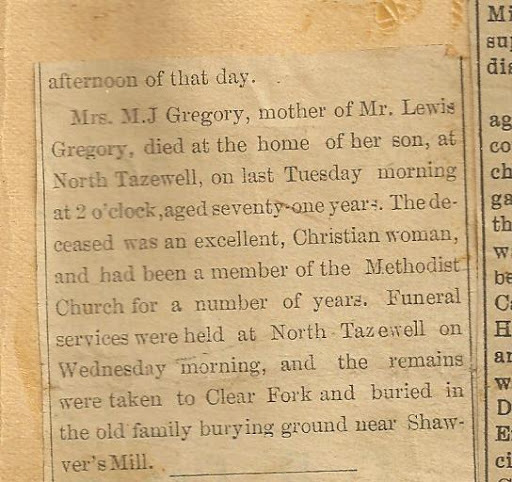 Eliza J., wife of Chas H. Greever, died Nov. 9, 1881, age 62 y & 7 D. I think that would make her born Nov. 2, 1819. So actually she was 31 (Lacking one month) in 1850. So a 31 year old married woman with three children, could have welcomed young 20yr old Mary Daugherty, and been a friend and mentor. As you know, it was very common in 18th and 19th centuries, for a young girl to leave her family and go live with another family, not necessarily as a servant but more as a mother’s helper. Perhaps it was a way of dealing with adolescent attitudes which can be a little difficult between mother and daughter sometimes, but would have been tempered by being in another woman’s house. On 22 May 1852, twins were born. This was not unusual in the Gregory family to have twins. These twins were named John K. L. and Elizabeth H. John K. L. died the next day, 23 May 1852, but he was named for Daniel’s father, John Keatts Gregory. I do not know what the L stands for. 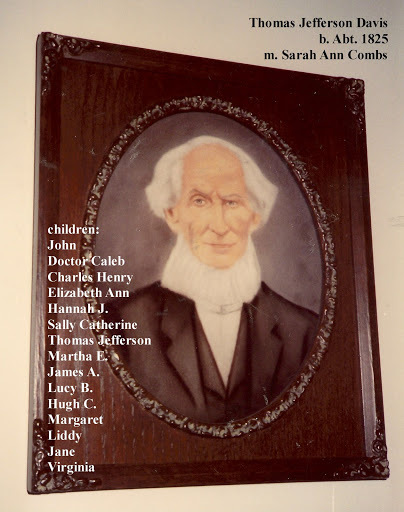 Elizabeth H. is most probably named after Daniel’s mother, Elizabeth Holland Corder Gregory. This was a strong custom to name the first after the father’s family. Next, in March, 1854, Nancy Ward Gregory is born. She is named after Mary Jane’s mother, Nancy Ward Daugherty. Again, a strong custom to name after the mother’s family at the next birth. 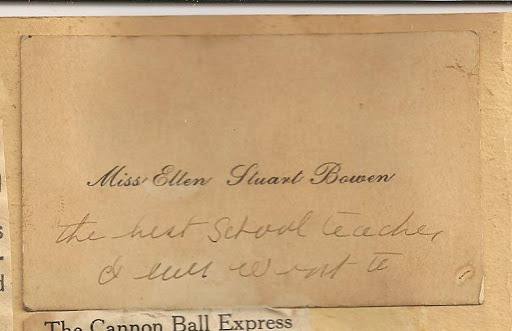 Then Eliza Greever Gregory is born June 1856. 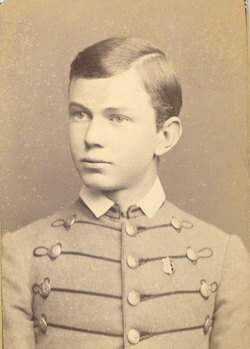 Erastus Wiley Davidson (John Adams, Erastus Granger, Robert W., Joseph, John Goolman) was born to John Adams Davidson and Lillie Emma Bette Riggle. Erastus Wiley was my 2nd cousin, 2x removed. Calling cards or visiting cards were first used in China in the 15th century. They became popular in Europe during the 17th century, and soon traveled across the Atlantic to the social elite in the Americas. Calling cards became an essential accessory for the rounds of reciprocal visits that played a significant role in genteel social life. They were used in accordance with an elaborate set of rules, according to which a would-be visitor would first leave her card with a new acquaintance at the acquaintance’s home. The visitor would not expect to be admitted into the house, but would hope to receive a card from the acquaintance in response, as a sign that a face-to-face meeting would be welcomed. 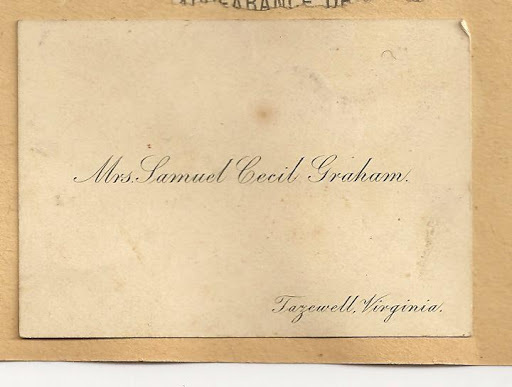 If the visitor did not receive a card in response, or if she received a card sent in an envelope (as opposed to one delivered personally by the acquaintance or her servant), she would know that she had received a social snub, and be discouraged from pursuing a face-to-face meeting. During the 19th century the middle classes, in imitation of more privileged society, adopted the practice of using calling cards. 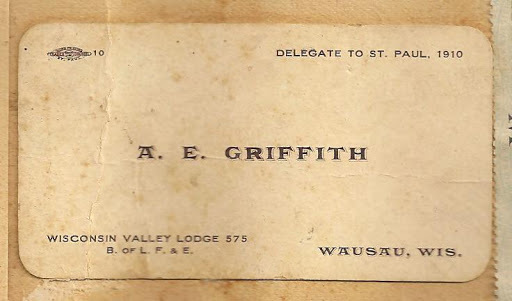 The purpose of the cards changed, however, when fewer servants were available to deliver them, and they evolved as a precursor to the modern-day business card. 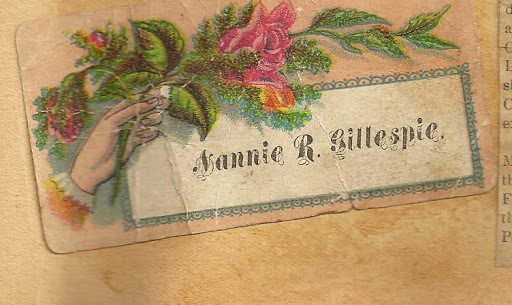 Calling cards during this period were generally smaller than today’s business cards, and usually consisted simply of a name engraved on glossy cardstock. 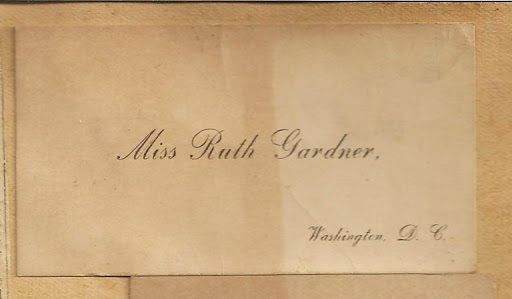 Emily Post, writing early in the 20th century, suggests that in certain social groups, calling cards could replace informal party invitations, contain messages of condolence or celebration, be used as endorsements, or be sent by mail. Even for Post, however, there are times when custom dictates that a calling card must be left. First, a guest must always leave a card after dining at someone’s house for the first time, or if they were invited to a dinner but were unable to attend. Another occasion that requires a calling card, according to Post, is the return of a first visit. 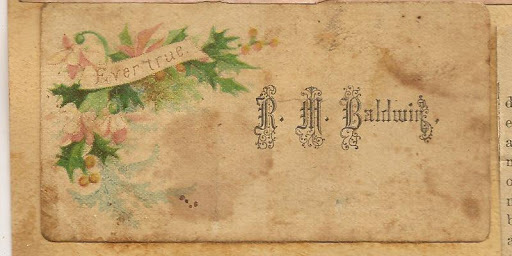 Post also considers a calling card essential when sending an invitation for the first time, and says that a card should always accompany the inquiries and expressions of sympathy that occur in the case of bereavement or illness in a family. 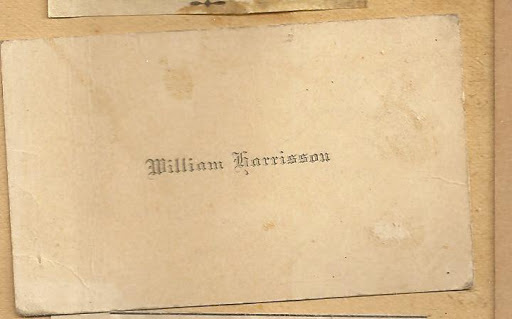 A William Harrison was married to my 3rd cousin, 4x removed, Anna Eliza Harman. This was 3rd cousin, 2x removed, from Grandmother Buckland. 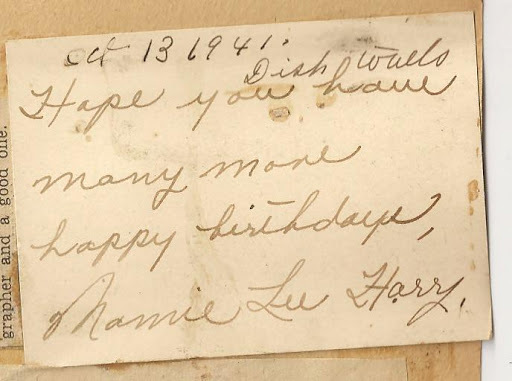 Some folks from Falls Mills, VA will remember Mrs. Mammie Lee Harry who lived beside and probably owned the land where the current day Harry Cemetery lies on Mudfork Road near Falls Mills Christian Church. 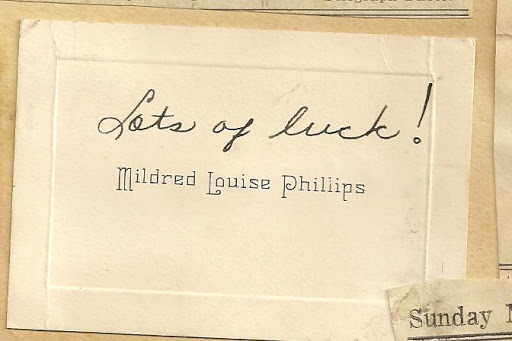 The above calling cards were from a scrapbook belonging to my grandmother, Mary Jane (Davidson) Buckland. Sadly enough, hospitality and good manners seem to be a lost art in our generation. 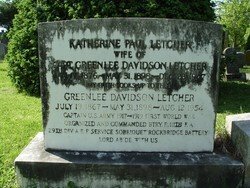 Captain Greenlee Davidson Letcher was one of eleven children born to Governor John Letcher and Mary Susan (Holt)in Rockbridge County, VA.
Captian Letcher rests in the Stonewall Jackson Cemetery in Lexington, VA.
Lacy Clemons Gregory was one of five children born to William Benton Gregory and Elizabeth Ann Ruble. 68 Years Ago Today, July 19, 1941. Edith was my 3rd cousin, 1x removed. 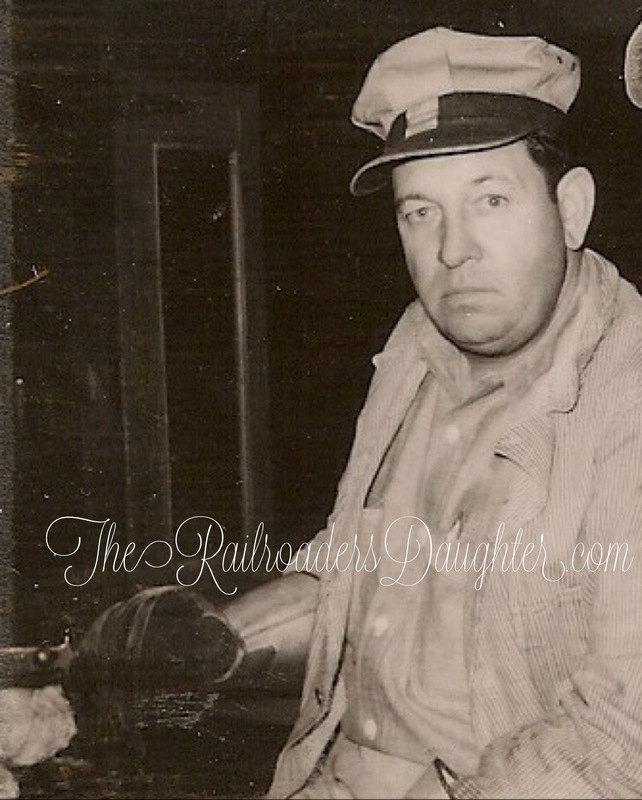 They had one son and one daughter who are probably still living, so I will not post their information. 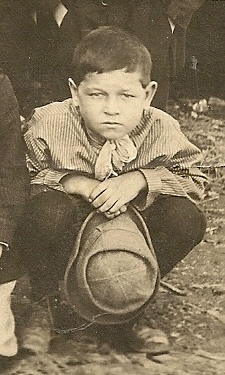 Robert Charles Walker was one of nine children born to Rev. 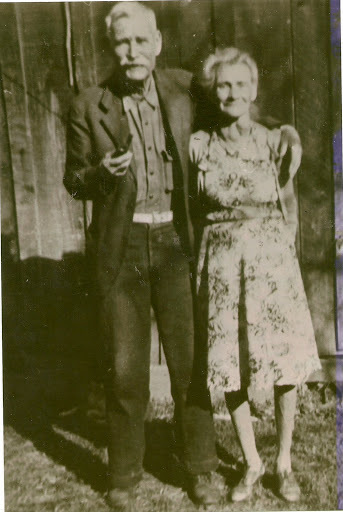 John Randolph Walker and Mary Jane Brown. He and his siblings were my 2nd cousins, 2x removed. Samuel W. Gregory, my 1st cousin, 3x removed, was one of ten children born to Thompson Edward Gregory and Martha J. Steele.